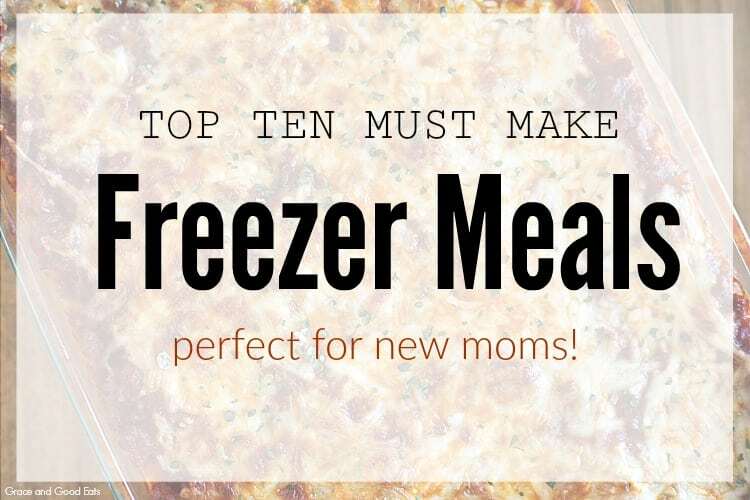 My top ten must make freezer meals for new moms– or anyone looking to get ahead in the dinner department! Quick and easy meals to freeze like meatloaf, chicken, chili, soup and more. With less than three weeks before baby is supposed to make his arrival, I am busy getting all of the last minute details in order- including stocking up on easy freezer meals! I struggle enough to get dinner on the table some nights without a newborn so I’m determined to have some of our favorites ready and waiting this time around. 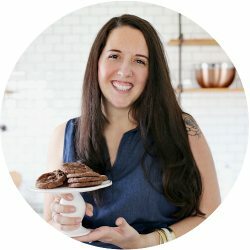 I’ve gathered ten freezable meals below to share with you- some crockpot meals, a few easy dump meals, and of course some freezer casseroles. These freezer recipes are perfect whether you’re expecting, wanting to gift a new Mom, or just looking to get ahead in the dinner game. 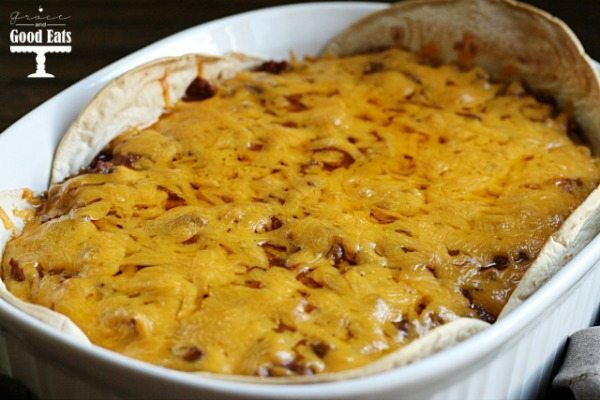 This is my favorite Homemade Chili recipe! We like it spicy, but you can always tone it down (especially if Mom is breastfeeding). 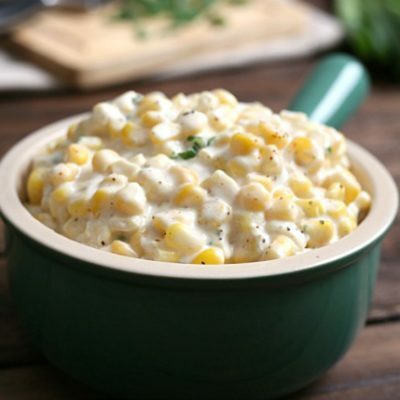 It’s perfect to serve with cornbread or over hot dogs, fries, or rice. I also have a version of Chili with Beans if you prefer that. FREEZER INSTRUCTIONS: Cook as directed, freeze, and thaw in the refrigerator overnight when ready to use. Reheat in the microwave for individual servings or reheat the whole batch on the stovetop (until heated through). 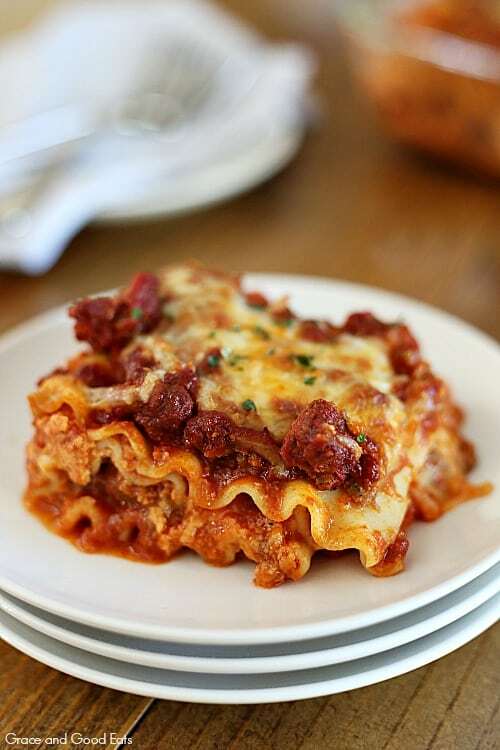 I’ve come around on ricotta- especially in my yummy Italian Stuffed Shells– but I still prefer this Lasagna Without Ricotta recipe. 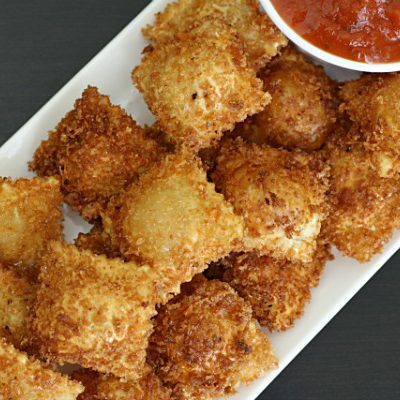 It’s perfectly creamy and cheesy. This is my go-to recipe to take to families with a new little one. Grab a pre-mixed bag of salad and loaf of bread from the bakery and you’ve got dinner done! FREEZER INSTRUCTIONS: Cook as directed, freeze, thaw in the refrigerator overnight when ready to use. Bake in the oven 350 degrees until the center is hot (usually up to 45 minutes). See more freezer instructions for this in the post. 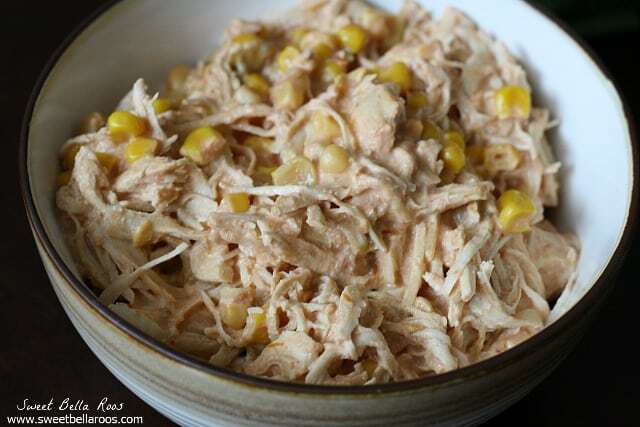 This Southwest Chicken slow cooker/ freezer meal makes it in our meal rotation pretty regularly. My family loves it with cornbread. It’s super simple- you’re only five ingredients away from a delicious dinner. FREEZER INSTRUCTIONS: Freeze uncooked, cook in the slow cooker as directed. FREEZER INSTRUCTIONS: Cook noodles, follow the recipe up until putting in the oven, freeze instead of baking. To reheat- thaw in the refrigerator overnight, bake in oven 350 degrees until the center is hot (usually up to 45 minutes). 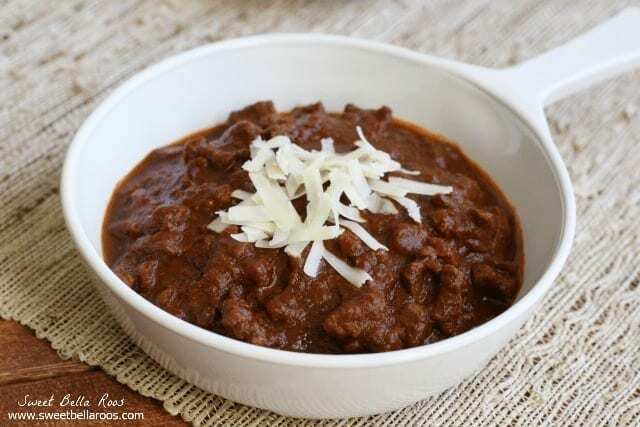 This Taco Chili is another easy slow cooker/ freezer meal that can be tossed straight from the freezer into the crock pot. 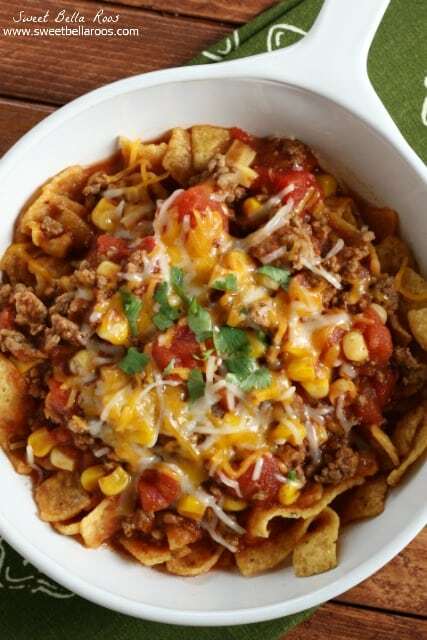 We serve it over corn chips (with extra cheese!). 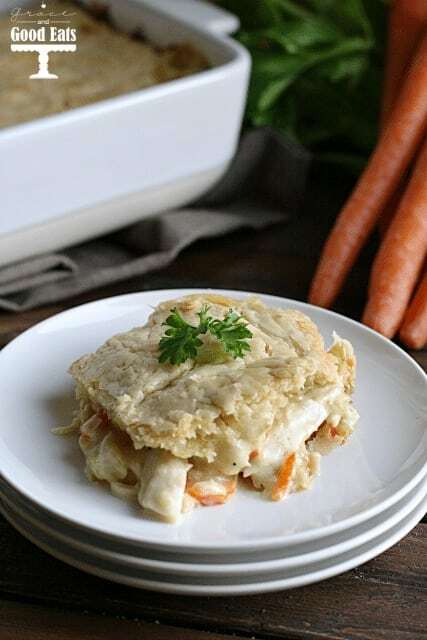 This Chicken Pot Pie is one of my favorite comfort foods- definitely new mom worthy. I prefer to freeze the filling, let it thaw in the refrigerator, and then pour into a frozen (or homemade) pie crust when ready to bake. FREEZER INSTRUCTIONS: Cook the filling as directed and then freeze. When ready to reheat, thaw in the refrigerator overnight, pour thawed filling into a frozen pie crust and bake as directed. 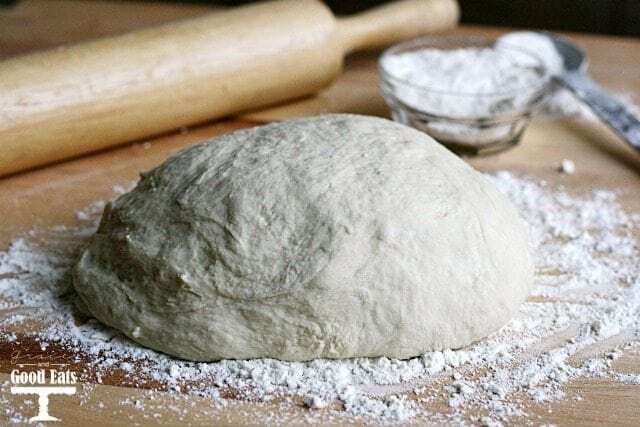 This Homemade Pizza Dough is a great staple to keep in the freezer. This can be customized with endless toppings; we love to make chicken Alfredo pizza and taco pizza. FREEZER INSTRUCTIONS: Prepare as directed, freeze instead of bake. To reheat- thaw in refrigerator and then bake as directed. We aren’t big on regular meatloaf around here, but we all love this version full of Mexican flavors. Serve this Mexican Meatloaf with rice or scoop it up with tortilla chips. FREEZER INSTRUCTIONS: Cook as directed. To reheat- thaw in the refrigerator overnight, bake in the oven 350 degrees until the center is hot (usually up to 45 minutes). 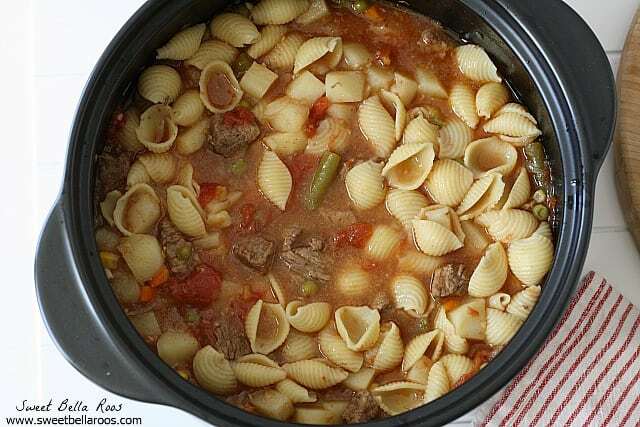 This Beef and Vegetable Soup is another comforting classic. 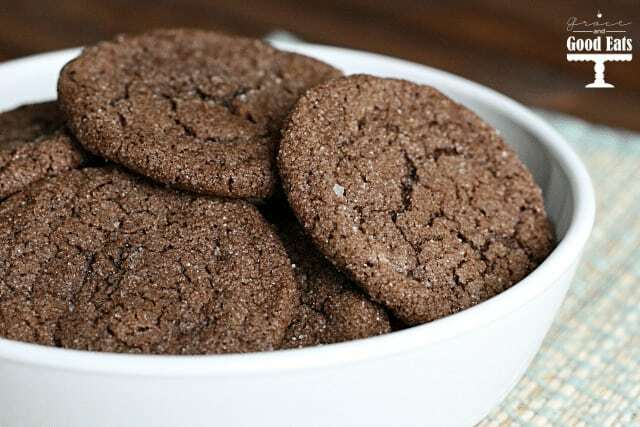 I have a slow cooker version as well, but this recipe is my favorite. FREEZER INSTRUCTIONS: Cook as directed, but freeze without the cooking and adding noodles. To reheat- thaw in the refrigerator overnight, reheat in the microwave per individual serving or on the stovetop for the entire batch. Add cooked noodles when ready to serve. 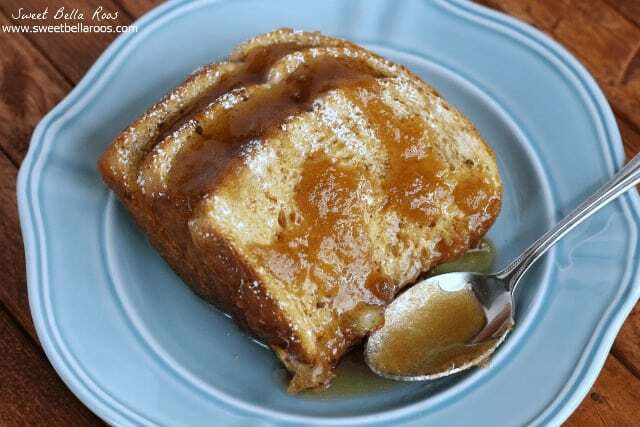 I know this Overnight Caramel French Toast seems kind of randomly added to the list, but trust me, it is SO delicious. 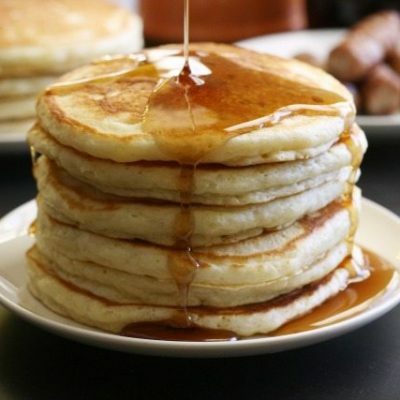 Perfect for a weekend breakfast or even for dinner. FREEZER INSTRUCTIONS: Cook as directed, to reheat- thaw in the refrigerator overnight, bake in the oven 350 degrees until the center is hot (usually up to 45 minutes). 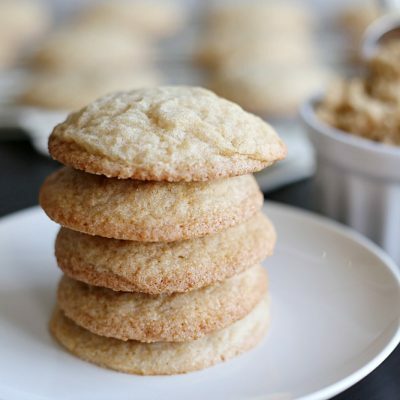 You can download my FREE Cookies e-book for more yummy cookie recipes. 5. Freeze uncooked, cook in the slow cooker as directed from frozen. 6. Cook the filling as directed- freeze. When ready to reheat, thaw in the refrigerator overnight, pour thawed filling into a frozen pie crust and bake as directed. 7. Prepare as directed, freeze instead of bake. To reheat- thaw in refrigerator and then bake as directed. 9. Cook as directed, freeze without the noodles. 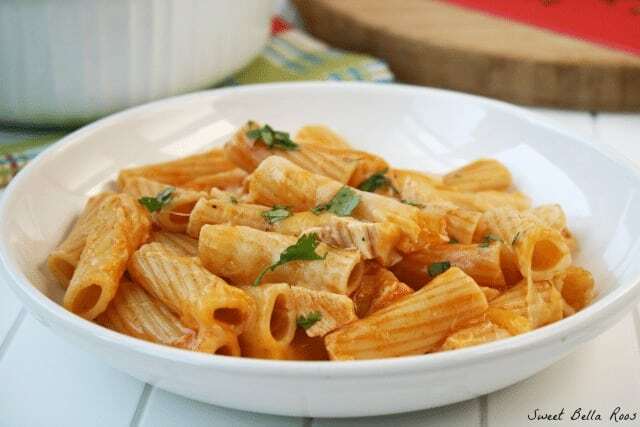 To reheat- thaw in the refrigerator and reheat in the microwave per serving or on the stovetop. Add cooked noodles. I’m not a new mom but these sure would help me out on my husband’s lunches throughout the week! 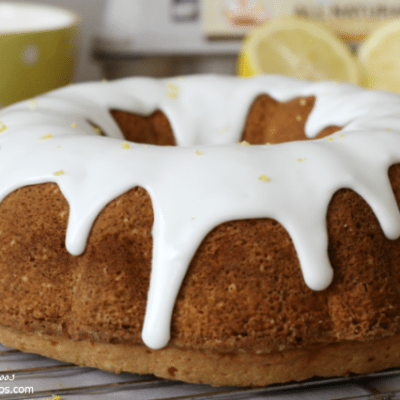 Thanks for linking up with the Delicious Dishes Recipe party! What a wonderful list of freezer meals!! We make freezer meals monthly in our house. With 6 kids it makes life so much easier! Thanks so much for linking up to Inspire me Monday!! Have a blessed weekend!! Yum! Would have happily been on the receiving end of these meals over the last few months. So glad you shared this with us at Idea Box Link Party!! Going to give that french toast a try!